One of my best travel memories would be a visit to The Elephant Sanctuary in Chaing Mai, Thailand, a camp that rescues Elephants. The joy I experienced this day will be with me forever. Being able to get up close and personal with these incredible creatures, feeding, riding and bathing them was like a dream coming true and I'll cherish it forever. My dreaming memory started out traveling by bus to get to the Camp. Once we arrived at the camp there weren't anymore roads ahead, just open scenery to look at with a lot of dry dirt, flat lands and elephants off in the distance. As we walked towards these amazing animals we were given the expectations for the day. And it was about to get exciting. We're all split in two smaller groups and I was lucky enough to be in the first group to feed the elephants. The feeding was fast, the Elephants were hungry! Or maybe they’re always hungry for Bananas. I couldn’t stop laughing. The trunks just kept touching me, sucking onto me in search of more food! I couldn’t peel the Bananas fast enough, it was so much fun! Then we learned how to give commands to the elephants to move up, down, forward and stop. I immediately volunteered to get up on one of the Elephants first. 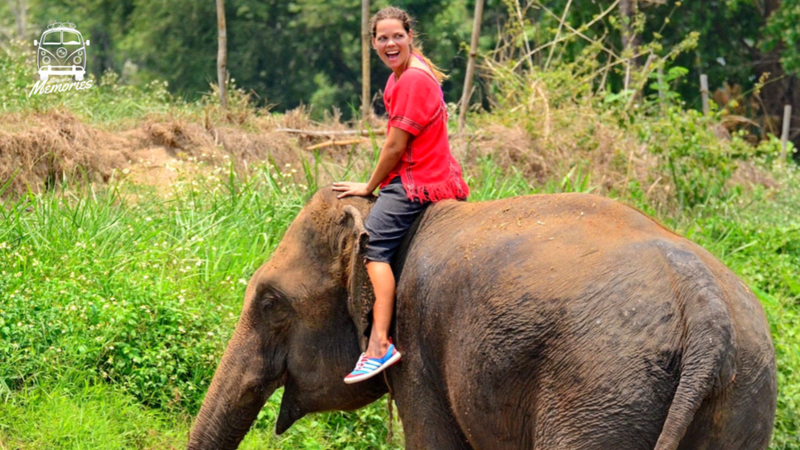 Riding on a elephant is a thrilling experience. It moves very abruptly and is hard to understand what to do. We were all cracking up and trying to remember the language in a crash course setting. I wish everyone could experience the beauty of these animals. They’re huge and incredible! If you're heading to Thailand, you should definitely visit this sanctuary. The wild life experience Thailand offers is incredible, but not everybody treats animals with respect and love like this sanctuary. This memory belongs to our Passenger Tammie Figlinski (@LostMyDesk) . All the pictures and video belongs to Tammie's personal archive. To know more about our Passenger @LostMyDesk, click here. PLEASE, TELL US YOUR THOUGHTS ABOUT THIS MEMORY, LEAVE US A COMMENT. FEEL FREE ALSO TO LIKE AND SHARE THIS MEMORY ON FACEBOOK, TWITTER, STUMBLEUPON AND PIN IT ON PINTEREST.